Minnesota Vikings offensive lineman T.J. Clemmings lined up at both tackle and guard on the right side of the line during OTAs, following the signings of Riley Reiff and Mike Remmers during free agency. 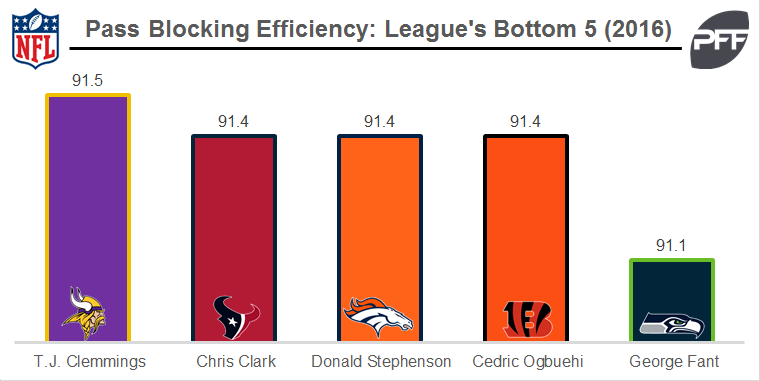 After a rough rookie season (PFF grade 39.7), Clemmings struggled again in 2016, ranking 76th out of 78 eligible tackles. Pass protection in particular was a cause for concern, with Clemmings allowing 58 pressures (of which 9 resulted in a sack), for a rate of one pressure every 9.3 pass blocking snaps. Despite these struggles, the Vikings will hope that with this change of position, he will be able to turn the corner and regain his 2014 form during his last year at Pittsburgh, where he was PFF’s fifth-ranked OT in college.